Dr. Debra Halsey, D.D. S.
Drs. 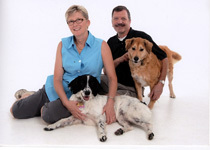 Halsey and Carmody have been married for the past 26 years and have raised two children. We feel this gives us a unique perspective and also creates a distinctive twist to the term: "Family Dentistry." Welcome to Troy, MI dentists at Rochester Dental. Finding a good dentist for yourself or your family may be one of the most important health decisions that you make. We take a friendly, caring approach to each patient. We are a modern dental office with old fashioned values that includes an appreciation of getting to know our patients and their concerns. What sets us apart is we treat you as we would treat a member of our own family. We want to be your dental home in Troy, MI. If you are experiencing a dental emergency, call us. Dental emergencies are always seen promptly, often the same day. At Rochester Dental, our priority is to deliver quality family dental care to informed patients in a comfortable and convenient setting. When you have dental problems, you need to turn to a dentist who listens and responds ... an experienced doctor who knows the field and can effectively diagnose and treat your needs ... a friendly family dentist who counsels you on the best ways to maintain and improve your health. Our family dentists meet all these criteria. Plus, you benefit from a dedicated team of trained professionals who give you the individualized attention you deserve. Rochester Dental believes that informed patients are better prepared to make decisions regarding their health and well-being. That is why we've included an extensive section on this website covering the full array of topics associated with dentistry and dental diagnoses and treatments. We encourage you to look through these pages whenever you have an interest or concern about cosmetic dentistry, teeth whitening, dental implants, dental crowns, family dentistry, dental implant FAQs or other dental services. The best care in the world doesn't mean anything if you can't access it. At Rochester Dental, we strive to make our Troy office as efficient and convenient as possible. Included in these web pages is information about Rochester Dental's office, including our Troy location, maps, directions, hours, insurance policies and appointment scheduling. You can even email a request for an appointment right here! A complete range of procedures for a healthy, active lifestyle and fresh new smile. A modern dentistry practice of exceptional care with old-fashioned values and a unique level of personal services. All phases of general dentistry and cosmetic services. One-on-one explanations and personalized attention throughout diagnosis and treatment. Complete treatment plans and consultations to discuss possible solutions. Relationships with top dental specialists. At Rochester Dental, we believe that a healthy smile is directly related to a healthy body. We listen to your concerns and take time to properly answer your questions. We also welcome second opinions. Give us a call if you are experiencing a dental emergency.